You've conquered the post-apocalypse in plenty of games before - but what about the post-post-apocalypse? Double Fine's new top-down roguelike Rad drops you into a world that's been blown up twice over, and your teenage avatar's malleable DNA is the key to survival. By soaking up and metabolizing the toxins of the irradiated wasteland, beating down glowing mutants as you go, your body will transform in all kinds of ludicrous ways to help you progress further on this treacherous perma-death journey. 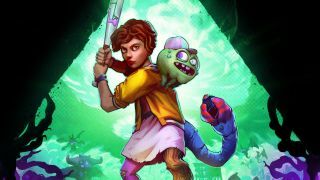 After getting some hands-on time with Rad, I was reminded of two other beloved games that treat the apocalypse like an action-packed playground: Bastion and Nuclear Throne. As always, it's the young people who are saving the planet. You play as a teen from a small village called The Fallow, chosen by the town elder to venture into the unknown and look for a replacement for your community's failing power source. The reason your ambiguously aged 13-to-19-year-old has to take on such an endeavor is that your body can withstand intense mutations of the exo (outward) and endo (inward) variety, which offer all kinds of benefits (and potentially a few drawbacks). The exo mutations are the showstoppers, and the reason most of Rad's screenshots show your hero looking like a mishmash of monstrous limbs and flaming skulls. They perfectly tap into my love of late '80s action figures that had limbs you could mix and match, which I'm pretty sure were real and not a hallucination my young mind made up. Rad is soaked in the neon light of '80s aesthetics, with bright colors, synthesizer-heavy jams, and totally tubular lingo (the town elder thinks of these as words of power). You've even got cassette tapes as currency and floppy disks acting as chest keys. "Some of the inspiration for the game is my teenagerhood in the late '80s, and all the weird, surreal Gamma World game sessions I used to GM, a lot of the crazy Hollywood stuff from the era, and [the] nuclear panic," says Lee Petty, Rad's project lead and a Double Fine veteran who previously helmed Headlander and Stacking. The mutation mechanic is the clearest parallel to Nuclear Throne, though Rad focuses much more on melee combat compared to Vlambeer's modern bullet hell. You start every run as an ordinary human wielding a baseball bat, and over time your body will morph on the fly whenever your rads meter fills up, transforming you in some randomly chosen way. There is one very helpful, baked-in mutation: your character leaves behind a trail of verdant growth wherever they go, as their body converts deadly toxins into new life. Running on trodden ground gives you a speed buff, not unlike Zerg running on creep-coated ground in StarCraft, and these grassy paths help you retrace your steps and figure out where to go if you get turned around in the wide-open levels. In my run I encountered an exo mutation that gave me a giant cobra head (with the nice touch of multiple, spider-like eyes on one side of its face), which extended my melee reach with a vicious bite. I also had a fun bit of body horror when my head transformed into an unsightly air bladder, like some kind of fleshy Whoopee cushion - but it provided extra lift on my jumps and could knock back enemies with ease. Speaking of jumps, Rad does include some light platforming, and I eventually got a pair of bat wings that let me glide across gaps to create huge shortcuts in the wide-open levels. Mastering your mutations on the fly will be key to surviving Rad's wild wastes, as you strike a balance between active exo abilities and passive endo boons. "They can evolve over the course of the game, you can get multiple exo mutations at once, they can combine, they can be used in sequence," says Petty. "They all have an obvious use, and they might have several other not-so-obvious uses that you can learn while playing." For instance, the longer reach of the cobra head lets you snap up items floating in hazardous toxic pools. As with all great roguelikes, discovering bizarre tricks and unexpected synergies is a large part of the fun. "Not all mutation are as easy to use, and I think this is part of the magic of roguelike loops - you want some high highs and some low lows," says Petty. "If everything was balanced, say, according to a normal single-player progression game, where everything's about as powerful as everything else, then you lose some of the unexpected drama." Successful runs through Rad's three diverse biomes (each with their own sub-levels) take about an hour on average, but the way your body ends up morphing can drastically affect the pace of your progress (not to mention all the deadly creatures who will attack you on sight). You've got plenty of incentive play through Rad repeatedly, with unlockable avatars and multiple endings that expand the initially cryptic story. "Our endings are basically in a set order from doing successful runs, but they change other things in the runs after that," says Petty. Discoverable lore items will open up new bits of backstory when chatting with The Fallow's citizens, who you can visit between levels. Bastion comparisons arise from the mysterious history of the post-post-apocalypse, along with the booming narration of the town elder and an unknown woman's voice adding context to your exploration. I had a blast playing through Rad for a bit, though I failed to reach and defeat the mid-boss across two runs. I could blame my deaths on hard-to-see hits, what with the zoomed-out camera and glowing visuals, but realistically I probably just beefed it both times. Rad is coming to Switch, PS4, Xbox One, and PC this summer, so make sure your body is ready for some unexpected mutations by then. Alongside Rad, Nintendo also recently showed off Cadence of Hyrule, the Zelda-powered Crypt of the Necrodancer sequel nobody expected.